Radhika’s vision was certainly not positive about the current Sri Lankan government. 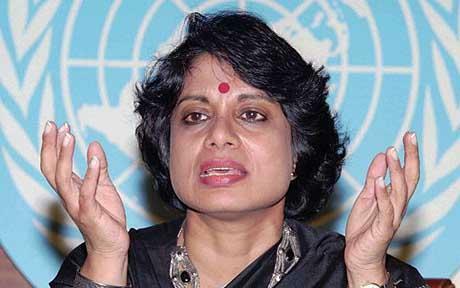 Her characteristically dramatic pronouncement, that ‘All is Disaster’, when the world at large defeated the effort to put Sri Lanka in the dock at the Special Session of the Human Rights Council in Geneva last May, was ample confirmation of a mindset that is sadly the principal voice with regard to Sri Lanka at senior policy making levels in the United Nations. That is why we should feel sympathy for Ban ki Moon, rather than irritiation, when his actions suggest negative views about Sri Lanka. Those who speak for us are seen as sympathizers of government, whereas those who are negative are assumed to be objective witnesses. It should be noted however that Ban ki Moon is not entirely unaware of the actual situation. Radhika was supposed to resign from the Board of ICES when she took on her current position with the United Nations. However she claimed that she had permission from the Secretary General to continue for a while, and was thus wholly responsible for introducing Dr Mani to ICES. She took part in, indeed seems to have summoned, the Board meeting at which Dr Mani was appointed. Though she had by then resigned, she saw no impropriety in attending (or running things) as a substitute for Bradman Weerakoon. She continued thereafter to attempt to influence ICES decisions. Mr Bradman Weerakoon in fact reinstated Dr Mani after she had been dismissed early in 2008, following Radhika urging such reinstatement in a letter which contained a veiled threat of withdrawal of Ford Foundation funding for the ICES endowment. Such machinations, it should be added, should not be seen as arising from sympathy for the LTTE as is sometimes alleged, I think both wrongly and unfairly. Bradman Weerakoon’s positive dealings with the LTTE arose from his own political affiliations, and allegations of treachery against him and his associates obfuscate the real problems. Given his undoubted charm, a trait he shares with Radhika, and his devotion to a particular political party, suggestions that he was in favour of Prabhakaran were self-evidently absurd, and took away from the real threat to Sri Lankan sovereignty and democracy that his actual predilections represented. Incidentally, Bradman Weerakoon is now once more back on the ICES Board, the new one that he manoevered into place after the Rama Mani scandal. Seeming to coincide with his return was another scandal, as confirmed by the investigative journalist Michael Hardie (who has not however investigated that particular problem as yet), namely the dismissal of the last ICES Director, Nishan de Mel. To move back to Dr Mani from the devoted defenders who nearly succeeded in keeping her on in Sri Lanka, she had committed ICES to being a Regional Centre of the Global R2P Centre in New York. That Centre was headed by Gareth Evans and Radhika served on its Board and doubtless knew what was going on, even though the ICES Board in Colombo was ignorant of this commitment. When the scandal broke, Radhika claimed that she had been requested by Ban ki Moon to serve on the Board of the Global R2P Centre, but it turned out that this was not in writing, and she subsequently had to resign from that position. I am sure that, with his customary politeness, Ban ki Moon would not have insisted she resign, but his circumspection in this regard is what continues to convince me that, left to himself, he would not be unfair. Two elements contributed to Sri Lanka finding out about what was going on before it was too late. First, Dr Mani had managed to run down the ICES finances (though Radhika claimed later that it was more her fault for signing cheques without checking rather than her protégé’s), leading to questioning by some senior researchers at the institution. Fortunately this led to the Canadian High Commissioner Angela Bogdan (Gift of God is what her name means, the angelic element thrown in for good measure) getting involved, in a manner that made it clear that something more than sisterly solidarity was going on. She practically threatened one of those who had questioned Dr Mani, and claimed in demanding her reinstatement that ‘Canada will not be able to move forward with funding the Pluralism Conference until the situation is clarified….The aforementioned matters have been raised with me by several Heads of Mission and leading members of civil society’. This extraordinary behaviour coincided with the discovery by the head of a local and locally oriented Civil Society organization, Colonel Anil Amarasekera, that the Global R2P Centre was advertising ICES Colombo as a regional office. He wrote to me about this, and putting two and two together was not difficult, given Ms Bogdan’s extraordinary blackmailing interference and the enormous efforts then put in by Radhika and Bradman Weerakoon to keep Rama Mani on. I myself was a victim of the high level pressures brought to bear, with Ms Bogdan complaining about me to the Foreign Ministry. Sadly that Ministry failed to take up my request that they discuss her strange conduct, and find out who the Heads of Mission and leading members of civil society were who had taken up Rama Mani’s cause as their own. Interestingly enough, long after Ms Bogdan left, one of the more enlightened heads of an international institution remarked that Ms Bogdan had been a great gossip who did much damage. Certainly, though it is possible I am being naïve, I do not think she was fulfilling official Canadian government policy in going out on a limb on behalf of Rama Mani. Meanwhile the NGO establishment, aided and abetted by ‘Lanka Dissent’, the website run by Mangala Samaraweera’s sidekick Ruwan Ferdinands, had been trying to rouse public feeling about Dr Mani’s expulsion. They organized a petition, and even cajoled the head of the UNDP regional office into signing this, though he later realized he had been misled and sent Dr Mani a strong letter to protest her deceitful conduct. By then fortunately, the Controller of Immigration having stood firm, Dr Mani had left, and the plot had collapsed for the moment. Sadly, we know how the situation would have been presented by this enormously powerful coalition. Angela Bogdan came out into the open, but she could not have been lying completely when she suggested she had the backing of other Heads of Misisons. Radhika had an important role in the UN, and was taken seriously by decision makers there. 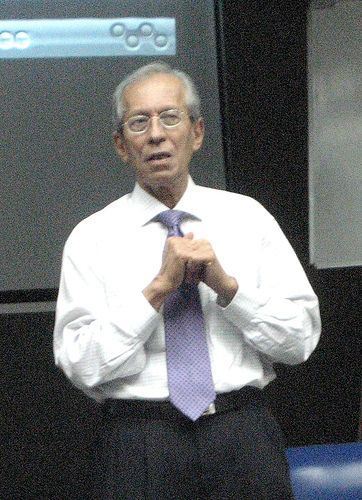 Her old friends at ICES, led by Bradman Weerakoon, were able to command respect as ‘leading members of civil society’, with no recognition of their political goals. Unfortunately the same type of coalition continues to operate, most recently using its considerable resources to promote the candidacy of General Sarath Fonseka for the presidency of Sri Lanka. General Fonseka may have thought he was going to run the country on the military lines he was used to if he won the Presidential election. I would like to think he was misguided, but it is also possible that he sees nothing wrong with a Pinochet model, such as this type of unholy coalition has produced in other places.